For other uses, see Tuva (disambiguation). Tuva (/ˈtuːvə/; Russian: Тува́) or Tyva (Tuvan: Тыва), officially the Tyva Republic (Russian: Респу́блика Тыва́, tr. Respublika Tyva, IPA: [rʲɪˈspublʲɪkə tɨˈva]; Tuvan: Тыва Республика, Tyva Respublika [tʰɯˈʋa resˈpʰuplika]), is a federal subject of Russia (a republic, also defined in the Constitution of the Russian Federation as a state). The Tuvan republic lies at the geographical center of Asia, in southern Siberia. The republic borders the Altai Republic, the Republic of Khakassia, Krasnoyarsk Krai, Irkutsk Oblast, and the Republic of Buryatia in Russia and Mongolia to the south. Its capital is the city of Kyzyl. It has a population of 307,930 (2010 census). From 1921 to 1944, Tuva constituted a sovereign, independent nation under the name of Tannu Tuva, officially, the Tuvan People's Republic, or the People's Republic of Tannu Tuva. The independence of Tannu Tuva, however, was recognized only by its neighbors: the Soviet Union and Mongolia. A majority of the population are ethnic Tuvans who speak Tuvan as their native tongue, while Russian is spoken natively by the Russian minority; both are official and widely understood in the republic. Tuva is governed by the Great Khural, which elects a chairman for a four-year term. Map of the Tuva Republic. The territory of Tuva has been controlled by the Xiongnu Empire (209 BC–93 AD) and Mongolian Xianbei state (93–234), Rouran Khaganate (330–555), Mongol Empire (1206–1368), Northern Yuan (1368–1691), Khotgoid Khanate and Zunghar Khanate (1634–1758). Medieval Mongol tribes, including Oirats and Tumeds, inhabited areas which are now part of the Tuvan republic. From 1758–1911 it was part of Mongolia which was under Manchu rule itself. During the 1911 revolution in China, Tsarist Russia formed a separatist movement among the Tuvans. Tsar Nicholas II ordered Russian troops into Tuva in 1912, as Russian settlers were allegedly being attacked. Tuva became nominally independent as the Urjanchai Republic before being brought under Russian protectorate as Uryankhay Kray under Tsar Nicholas II, on 17 April 1914. A Tuvan capital was established, called Belotsarsk (Белоца́рск; literally, "(Town) of the White Tsar"). Meanwhile, in 1911 Mongolia became independent, though under Russian protection. Following the Russian Revolution of 1917 that ended the imperial autocracy, most of Tuva was occupied from 5 July 1918 to 15 July 1919 by Aleksandr Kolchak's "White" Russian troops. Pyotr Ivanovich Turchaninov was named the governor of the territory. In the autumn of 1918, the southwestern part was occupied by Chinese troops and the southern part by Mongol troops led by Khatanbaatar Magsarjav. From July 1919 to February 1920 the communist Red Army controlled Tuva but from 19 February 1920 to June 1921 it was occupied by China (governor was Yan Shichao [traditional, Wade–Giles transliteration: Yan Shi-ch'ao]). On August 14, 1921, the Bolsheviks established the Tuvan People's Republic, popularly called Tannu-Tuva. In 1926, the capital (Belotsarsk; Khem-Beldyr since 1918) was renamed Kyzyl, meaning "red". Tuva was de jure an independent state between the World Wars. The state's first ruler, Prime Minister Donduk, sought to strengthen ties with Mongolia and establish Buddhism as the state religion. This unsettled the Kremlin, which orchestrated a coup carried out in 1929 by five young Tuvan graduates of Moscow's Communist University of the Toilers of the East. In 1930, the pro-Soviet regime discarded the state's Mongol script in favor of a Latin alphabet designed for Tuva by Russian linguists. In 1943 Cyrillic script replaced Latin. Under the leadership of Party Secretary Salchak Toka, ethnic Russians were granted full citizenship rights and Buddhist and Mongol influences on the Tuvan state and society were systematically reduced. Tuva became a part of the Soviet Union in 1944, with the approval of Tuva's Little Khural (parliament). The exact circumstances surrounding Tannu-Tuva's incorporation into the USSR in 1944 remain obscure. Salchak Toka, the leader of the Tuvan People's Revolutionary Party, was given the title of First Secretary of the Tuvan Communist Party and became the de facto ruler of Tuva until his death in 1973. 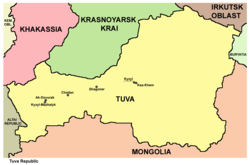 Tuva became the Tuvan Autonomous Oblast and, later, Tuva Autonomous Soviet Socialist Republic, on October 10, 1961. In February 1990, the Tuvan Democratic Movement was founded by Kaadyr-ool Bicheldei, a philologist at Kyzyl State Pedagogical Institute. The party aimed to provide jobs and housing (both were in short supply), and also to improve the status of Tuvan language and culture. Later in the year, there was a wave of attacks against Tuva's sizeable Russian community, including sniper attacks on trucks and attacks on outlying settlements with 168 murdered. Russian troops eventually were called in. Many Russians moved out of the republic during this period. To this day, Tuva remains remote and difficult to access. Tuva was a signatory to the March 31, 1992 treaty that created the Russian Federation. A new constitution for the republic was drawn up on October 22, 1993. This created a 32-member parliament (Supreme Khural) and a Grand Khural, which is responsible for foreign policy and any possible changes to the constitution, and ensures that Tuvan law is given precedence. The constitution also allowed for a referendum if Tuva ever sought independence. This constitution was passed by 53.9% (or 62.2%, according to another source) of Tuvans in a referendum on December 12, 1993. At the same time, the official name was changed from Tuva (Тува) to Tyva (Тыва). The republic is situated in the far south of Siberia. Its capital city of Kyzyl is located near the geographic "center of Asia". The eastern part of the republic is forested and elevated, and the west is a drier lowland. Ubsunur Hollow is a biosphere reserve, an environmentally protected zone and a top attraction. There are over 8,000 rivers in the republic. The area includes the upper course of the Yenisei River, the fifth longest river in the world. Most of the republic's rivers are Yenisei tributaries. There are also numerous mineral springs in the area. There are numerous lakes in Tuva, many of which are glacial and salt lakes, including Todzha Lake, a.k.a. Azas Lake (100 km²) – the largest in the republic, and Uvs Lake (shared with Mongolia and a World Heritage Site). The area of the republic is a mountain basin, about 600 m high, encircled by the Sayan and Tannu-Ola ranges. Mountains and hills cover over 80% of the territory. Mongun-Tayga ("Silver Mountain", 3,970 m) is the highest point in the republic and is named after its glacier. Major natural mineral resources of Tuva include coal, iron ore, gold, and cobalt. Fauna include sable, lynx, wolverine, weasel, maral, Siberian ibex, musk deer, bears, snow leopards, ground squirrels, flying foxes, and eagles. Much of the territory is affected by permafrost. The Tuva Republic is administratively divided into seventeen districts and two cities under republic jurisdiction (urban okrugs) (Kyzyl and Ak-Dovurak). The districts are further subdivided into sumons (rural settlements), towns under district jurisdiction (urban settlements), and urban-type settlements. Population: 307,930 (2010 Census); 305,510 (2002 Census); 309,129 (1989 Census). According to the 2010 Census, Tuvans make up 82.0% of the republic's population. Other groups include Russians (16.3%), and a host of smaller groups, each accounting for less than 0.5% of the total population. 18,689 people were registered from administrative databases, and could not declare an ethnicity. It is estimated that the proportion of ethnicities in this group is the same as that of the declared group. As can be seen above, during the period 1959–2010 there has been more than a doubling of ethnic Tuvans. The Russian population growth slowed by the 1980s and decreased by 50% since 1989. The official languages are Tuvan (Turkic) and Russian (Slavic). Outside Kyzyl, settlements have few if any Russian inhabitants and, in general, Tuvans use their original language as their first language. However, there is a small population of Old Believers in the Republic scattered in some of the most isolated areas. Before Soviet rule, there were a number of large ethnic Russian Old Believer villages, but as the atheist ideology crept in, the believers moved deeper and deeper into the Taiga in order to avoid contact with outsiders. Major Old Believer villages are Erzhei, Uzhep, Unzhei, Zhivei and Bolee Malkiye (all in the Kaa-Khemsky District). Smaller ultra-Orthodox settlements are found further upstream. Ethnic Russians make up 38.68% of the population (as of 2002 Census) in Kaa-Khemsky District, one of the most remote regions in Tuva. The population is mostly Old Believers. Russians account for 34.12% of the population in Piy-Khemsky and 19.80% in Todzhinsky. In Kyzyl, they account for 37.02%. Buddhist temple of Kyzyl (Цеченлиң/Tsechenling). Two religions are widespread among the people of Tuva: Tibetan Buddhism and shamanism. Tibetan Buddhism's present-day spiritual leader is Tenzin Gyatso, the fourteenth Dalai Lama. In September 1992, the fourteenth Dalai Lama visited Tuva for three days. On September 20, he blessed and consecrated the new yellow-blue-white flag of Tuva, which had been officially adopted three days previously. The Tuvan people – along with the Yellow Uyghurs in China – are one of the only two Turkic groups who are mainly adherents to Tibetan Buddhism, combined with native shamanism. During the 16th and 17th centuries, Tibetan Buddhism gained popularity in Tuva. An increasing number of new and restored temples are coming into use, as well as novices being trained as monks and lamas. Religious practice declined under the restrictive policies of the Soviet period but is now flourishing. Shamanism is being revived as well, also in organized Tengrian forms. According to a 2012 survey, 61.8% of the population of Tuva adheres to Buddhism, 8% to Tengrism or Tuvan shamanism, 1.5% to the Russian Orthodox Church, the Old Believers or other forms of Christianity, 1% to Protestantism. In addition, 7.7% follows other religion or did not give an answer to the survey, 8% of the population declares to be "spiritual but not religious" and 12% to be atheist. The head of the government in Tuva is the Chairman of the Government, who is elected for a four-year term. The first Chairman of the Government was Sherig-ool Oorzhak. As of 2007, the Chairman of the Government was Sholban Kara-ool. Tuva's legislature, the Great Khural, has 162 seats; each deputy is elected to serve a four-year term. The present flag of Tuva – yellow for prosperity, blue for courage and strength, white for purity – was adopted on 17 September 1992. The Republic's Constitution was adopted on 23 October 1993. On 3 April 2007, Russian president Vladimir Putin nominated Sholban Kara-ool, 40, a former champion wrestler, as the Chairman of the Government of Tuva. Sholban Kara-ool's candidacy was approved by the Khural on April 9, 2007. Tuva has a developing mining industry (coal, cobalt, gold, and more). Food processing, timber, and metalworking industries are also well-developed. Most of the industrial production is concentrated in the capital Kyzyl and in Ak-Dovurak. According to the HDI, the Republic of Tuva is the least developed region in Russia. Tuva is a region with a unique history, culture, and nature. All native zones of the Earth except savanna (even rainforest, see Southern Siberian rainforest) are featured in Tuva. There are more than 100 mineral springs in Tuva. The biggest of which are the warm mineral springs Ush-Beldir and Tarys, the temperature of the water is 52-85 °C. Cold mineral springs and salt lakes are popular among tourists and the general population for their medicinal qualities. The geographical location of Tuva between the east-Siberian taiga and central-Asian landscape engenders a wealth of flora and fauna. Wrestling competition in stadium "Хүреш" (from Tuvan, a reversed spelling of "Khuresh"). A yurt in Tos Bulak. Tuvan throat singer Kongar-ol Ondar. Khuresh, the Tuvan form of wrestling, is a very popular sport. Competitions are held at the annual Naadym festival at Tos-Bulak. Tuva has a rich cultural potential, which provides the population with wide access to cultural values, knowledge, and information. An important feature is the high safety of traditional culture, successfully developing professional art. The Tuvan people are traditionally a Central Asian nomadic culture. Tuva is an agrarian republic. The main branch of agriculture is livestock breeding (mainly sheep breeding and meat and dairy cattle breeding); also goat breeding and horse breeding are developed. In the tundra, reindeer are bred, in the mountains - yaks, south, in the semi-desert - camels. Tuva has a rich historical heritage and a preserved ethnic culture among the local population. Tuvan music features the world famous Tuvan throat singing (khoomei). This type of singing can be heard, in particular, during the performances of the Tuva National Orchestra. Sainkho Namtchylak is one of a few singers from Tuva to have an international following. Namtchylak is also very involved with Tuvan culture. Every year, she invites Western musicians to perform in Kyzyl and to learn about the republic, its culture, and its music. In recent years, Kongar-ool Ondar has become well known in the West as well, in large part because of the film Genghis Blues featuring Ondar and American blues singer Paul Pena. Huun-Huur-Tu has been one of the most well known Tuvan music ensembles since the late 1990s, while the Alash ensemble came to prominence in the early 2000s. The Tuvan language is Turkic, although with many loan-words from Mongolian. It is currently written with a modified Cyrillic alphabet, previously used Turkic runes, later Mongolian, then Latin alphabets. Then, Tuva was administered as part of Outer Mongolia, and the language difference was a determining factor in Tuva seeking full independence from Outer Mongolia, following the collapse of the Qing dynasty of China in 1911. Tuva is one of the few places in the world where the original form of shamanism is preserved as part of the traditional culture of Tuva. Shamanism presupposes the existence of good and evil spirits inhabiting mountains, forests and water, the heavens and the underworld. The mediator between man and the spirits is the shaman. It is believed that with the help of spirits the shaman is able to cure patients and to predict the future. In Tuva, shamanism peacefully coexists with Buddhism. Buddhism is associated with many folk rituals, calendar holidays, and folk medicines in Tuva. Centers of Buddhism in Tuva are Khuree – temples, temple complexes. The temple complex Tsechenling in Kyzyl – the residence of Kamba-Lama, head of Buddhism in Tuva. Treasures of the old Slavonic culture in the Asian Tuva saved along with the values of other peoples – children's folklore ensemble "Oktay" from the city of Kyzyl in the course several ethnographic expeditions In the old believers ' settlements were able to collect and record of conservatives extensive collection of samples of ancient singing art. The traditional culture of Tuvans is as Yurt-dwelling nomads, and national cuisine and folk arts and the craft, among which a special place is carving soft stone (agalmatolite). And of course, the archeology of Tuva. Excavations archaeologists of ancient burial mounds bring sometimes these discoveries, which for a long time determined in the excitement of the whole scientific world. So, the symbol of ancient Tuva became coagulated ring amazing beauty of bronze panther VIII century BC, discovered in the excavation of barrow Arzhaan-1. Rich a Scythian burial was discovered in 2001, during the excavation of barrow Arzhaan-2. Collection of gold jewelry from this burial is demonstrated now in the specialized hall of the National Museum Aldan-Maadyr in Kyzyl. The development of the cultural potential of the region is facilitated by the organization of festivals aimed at expanding interregional and international cooperation aimed at strengthening the image of the region, supporting cultural innovations: the ecological film festival "The Living Path of Dersu", the Interregional Festival of National Cultures "Heart of Asia". It has become a tradition to hold the international festival of live music "Ustuu-Khuree", the International Symposium "Khoomei - the Phenomenon of the Culture of the Peoples of Central Asia", the Regional Competition-Festival of Performers on National Instruments "Dingildai", the International Felt Festival "Patterns of Life on Felt" Pop songs "Melodies of the Sayan Mountains". Bandy is played in Tuva. The most important facilities of higher education include the Tuvan State University and the Tuvan Institute of Humanities, both in the capital, Kyzyl. 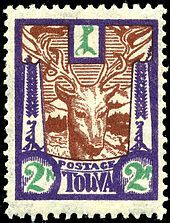 In the 1920s and 1930s, postage stamps from Tuva were issued. Many philatelists, including the physicist Richard Feynman, have been fascinated with Tuva because of these stamps. The stamps were issued mainly during the brief period of Tuvan independence and were not accepted by serious collectors until recently as they were thought to be produced in Moscow and not to represent a genuine postal service. Feynman's efforts to reach Tuva are chronicled in the book Tuva or Bust! and the video The Quest For Tannu Tuva: Richard Feynman – The Last Journey of a Genius (1988) which can be viewed online on YouTube. Project Tuva was named in honor of his efforts. Tuva was featured prominently in the award-winning documentary Genghis Blues. United Nations Human Development Index: Russian Federation – Republic of Tyva, rank: 79/79 (the lowest). Tuvan stamps are mentioned in a line of Gregory Corso's poem Marriage. Tuvan Sergey Shoygu, Russia's Minister of Defense, and previously Minister for Emergency Situations since 1994, is Russia's longest-serving minister, and a leader of Russia's governing party 'Unity'. Tuvans make wishes each morning, sprinkling milk on the ground, to the north, south, east and west, with a special wooden spoon with nine small hollows for the various milk products made. Russian Defense Minister Sergey Shoygu in 2012. Some Tuvans, even near Kyzyl, still live in traditional yurts, round, demountable and portable dwellings with sectional lath trellis walls, decorated pole roofs and covered with white felt and canvas, with colorful cloth lining. There is a central smoke-hole above the hearth or stove. It is used to tell the time as the sunlight moves around inside the yurt. The interior is arranged with the man's side to the left, the woman's to the right of the door facing East, with the altar cupboard facing that. Tuvans, as traditional nomads, knew no fixed national borders, which has led to small numbers being in areas outside the present Republic's boundaries, including as follows. China – Xinjiang: Tuwa people by Lake Kanas, Altay Prefecture. Russia – Irkutsk Oblast: Tofa people adjacent to north-east Tuva; Buryatia: Soyot people of the Upper Oka river. Mongolia – northern: Tsaatan people; north-western: Dukha/Duva people; western: Tsengel people. The Sayan Mountains in Tuva were featured in Bear Grylls' Man vs Wild popular adventure TV show. Tuva's territorial boundaries is not recognized by Republic of China based in Taiwan and its claimed by the ROC as part of the Mainland area. Tuvans are eligible for the Taiwan passport, but not residency rights to live in Taiwan. ^ Президент Российской Федерации. Указ №849 от 13 мая 2000 г. «О полномочном представителе Президента Российской Федерации в федеральном округе». Вступил в силу 13 мая 2000 г. Опубликован: "Собрание законодательства РФ", №20, ст. 2112, 15 мая 2000 г. (President of the Russian Federation. Decree #849 of May 13, 2000 On the Plenipotentiary Representative of the President of the Russian Federation in a Federal District. Effective as of May 13, 2000.). ^ Федеральная служба государственной статистики (Federal State Statistics Service) (May 21, 2004). "Территория, число районов, населённых пунктов и сельских администраций по субъектам Российской Федерации (Territory, Number of Districts, Inhabited Localities, and Rural Administration by Federal Subjects of the Russian Federation)". Всероссийская перепись населения 2002 года (All-Russia Population Census of 2002) (in Russian). Federal State Statistics Service. Retrieved November 1, 2011. ^ Official throughout the Russian Federation according to Article 68.1 of the Constitution of Russia. ^ "Chapter 1. The Fundamentals of the Constitutional System | The Constitution of the Russian Federation". Constitution.ru. Retrieved February 22, 2018. ^ Alatalu, Toomas (January 1, 1992). "Tuva. A State Reawakens". Soviet Studies. 44 (5): 881–95. doi:10.2307/152275. JSTOR 152275. ^ a b History of Mongolia, Volume II, 2003. ^ "Tuva: Russia's Tibet or the Next Lithuania?". Retrieved February 22, 2018. ^ "Tuva". Geographic Bureau — Siberia and Far East/Tuva. Archived from the original on November 26, 2015. Retrieved May 4, 2016. ^ ”Tyva republic approves own constitution”], BBC Monitoring Service, December 15, 1993. ^ "Top Attractions of Russia". Retrieved February 21, 2018. ^ "Каталог публикаций::Федеральная служба государственной статистики" (in Russian). Gks.ru. May 8, 2010. ^ "Перепись-2010: русских становится больше". Perepis-2010.ru. Retrieved November 16, 2012. ^ "Староверы Республики Тыва. Фото" (in Russian). Rodonews.ru. Retrieved November 16, 2012. ^ a b c "2012 Arena: Atlas of Religions and Nationalities in Russia". sreda.org; retrieved February 22, 2018. ^ "Dalai Lama". Avantart.com. Retrieved November 16, 2012. ^ "Russia's Daily Online". Kommersant. Retrieved November 16, 2012. ^ "Tyvans keen to protect traditions". BBC News. September 19, 2009. Retrieved November 16, 2012. ^ "Tuva-Online: New Head for Tuva Chosen by President Putin". En.tuvaonline.ru. Retrieved November 16, 2012. ^ "Tuva-Online: 40-year-old Head of Tuva Backed by Parliament". tuvaonline.ru. Retrieved December 22, 2017. 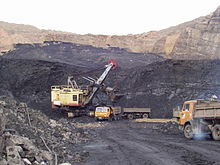 ^ "Tyva coal line PPP plan revised". Railway Gazette. Retrieved November 16, 2012. ^ a b "Культура Республики Тыва - Официальный портал Республики Тыва". gov.tuva.ru (in Russian). Retrieved July 24, 2017. ^ a b c d "The Republic of TUVA, travel guide" (PDF). ИПК «ПЛАТИНА». 1: 50. 2016 – via ИПК «ПЛАТИНА». ^ "Google Translate". bandynet.ru. Retrieved February 22, 2018. ^ ""Philately's Ugliest Ducklings: Rehabilitating the 1934–36 Issues of Tannu Tuva"". Archived from the original on July 14, 2011. Retrieved July 14, 2011. by James Negus at TTCS. Originally published in The Philatelic Journal, July–September 1960. ^ "Man Vs Wild Siberia 1–5". YouTube. November 27, 2008. Retrieved November 16, 2012. ^ The Republic of China (ROC), now based in Taiwan, is involved in territorial disputes with many governments bordering mainland China. Due to the One-China policy, it has no formal diplomatic relations with any of these states. The ROC recognizes neither the People's Republic of China (PRC) nor its border agreements or treaties with any other countries. Article 4 of the Constitution of the Republic of China states that "The territory of the Republic of China according to its existing national boundaries shall not be altered except by resolution of the National Assembly." Section 5 of Article 4 of the Additional Articles of the Constitution of the Republic of China now overrides this provision, with the power of the National Assembly to alter transferred to the Legislative Yuan and the electorate. 6 мая 2001 г. «Конституция Республики Тыва», в ред. Конституционного закона №748 ВХ-2 от 7 июля 2008 г. (May 6, 2001 Constitution of the Tyva Republic, as amended by the Constitutional Law #748 VKh-2 of July 7, 2008. ). Wikimedia Commons has media related to Tyva. Wikivoyage has a travel guide for Tuva. Audio of the Tuvan national anthem recorded by the Tuvan National Orchestra. The orchestral arrangement was composed by Ayana Samiyaevna Mongush.